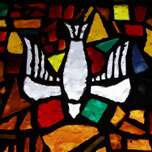 The Holy Spirit is indispensable to our spiritual life. And yet, we do our best to live independently, relying on Him as little as possible. Big mistake. Spurgeon helps us realize what we're missing. Faith needs watering and refreshing. The dry spells of life take their toll, no question. But the Holy Spirit is on the lookout, with special tentacles that spot spiritual lethargy, and lukewarmness.And then, it's time for action.